Prions are associated with 20 different brain diseases in humans and animals. The scientists say their work suggests new approaches might be necessary to develop therapies for these diseases. In the study, published in the journal Science, the scientists transferred prion populations from brain cells to other cells in culture and observed the prions that adapted to the new cellular environment out-competed their brain-adapted counterparts. 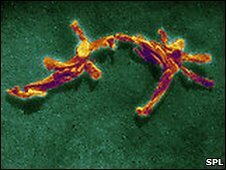 When returned to the brain cells, the brain-adapted prions again took over the population. Charles Weissmann, head of Scripps Florida's department of infectology who led the study, said: "On the face of it, you have exactly the same process of mutation and adaptive change in prions as you see in viruses. "This means that this pattern of Darwinian evolution appears to be universally active. "In viruses, mutation is linked to changes in nucleic acid sequence that leads to resistance. "Now, this adaptability has moved one level down- to prions and protein folding - and it's clear that you do not need nucleic acid (DNA or RNA) for the process of evolution." Mammalian cells normally produce cellular prion protein or PrPC. During infections, such as the human form of mad cow disease known as vCJD, abnormal or misfolded proteins convert the normal host prion protein into its toxic form by changing its conformation or shape. "It was generally thought that once cellular prion protein was converted into the abnormal form, there was no further change", Mr Weissmann said. "But there have been hints that something was happening. "When you transmit prions from sheep to mice, they become more virulent over time. "Now we know that the abnormal prions replicate, and create variants, perhaps at a low level initially. "But once they are transferred to a new host, natural selection will eventually choose the more virulent and aggressive variants." Professor John Collinge, of the Medical Research Council's (MRC) Prion Unit, described the research as exciting confirmation of a hypothesis that he had proposed two years ago, that there could be a "cloud" or whole array of prion proteins in the body. He called it the cloud hypothesis. He said: "The prion protein is not a clone, it is a quasi-species that can create different protein strains even in the same animal. "The abnormal prion proteins multiply by converting normal prion proteins. "The implication of Charles Weissmann's work is that it would be better to cut off that supply of normal prion proteins rather than risk the abnormal prion adapting to a drug and evolving into a new more virulent form. "You would do this by trying to block the sites on the normal prion protein that the abnormal form locks on to to do its conversion. "We know there is an antibody that can do this in mice and the Medical Research Council's Prion Unit have managed to engineer a human antibody to do this. "It is currently undergoing safety tests and we hope to move to clinical trials by the end of 2011"
Professor Collinge said the MRC was also trying to find more conventional chemical compounds to do this and has been collaborating with the chemical company GlaxoSmithKline (GSK). He said: "They have given us access to their chemical libraries, which contain millions of compounds, and we have already identified some that may work well. "This is a timely reminder that prion concerns are not going away and that controls to stop abnormal prions being transmitted to humans through the food system or through blood transfusions must be vigorously maintained."